Legend seems to have been mixed with reality on Santorini island. Tsitouras Collection Hotel is a part of that legend that has falsified reality. Perched on a cliff one thousand foot above sea level, it overlooks the most spectacular scenery in the Mediterranean Sea. The main building of Tsitouras Collection is a mansion that was built in 1780 and has served as a school, a post office and a private house over the centuries. Owned by the famous art collector Dimitris Tsitouras, it was renovated in 1985 and has hosted great personalities such as Versace, Moschino, Joan Kennedy, Jack Lang, Demis Roussos, Harvey Keitel, Nana Mouskouri. Dimitris Tsitouras is a lifelong art lover and historian. 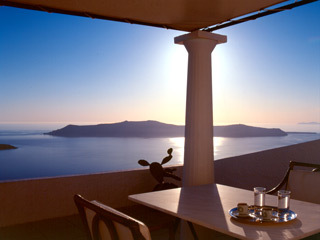 He has composed many books about Santorini island, known as the Greek Pompeii. Tsitouras has amassed over 4.000 Santorinian artefacts, last 40 years, all destined for his under construction museum. They presently adorn the five suites of his hotel. Each suite has its own unique artistic style and is named after the art collection it hosts. The House of the Sea has a characteristic atmosphere of romance, with hints of distant destinations and evidence of the lure of the sea. The Greco-Roman styled bathroom has been lined with pristine white marble, accented with black detail. There is a collection of 19th century charcoal sketches of male nudes by an anonymous Greek artist, an 18th century Russian icon depicting the stern figure of St Nicholas, patron saint of the sea, and there is one of the great Picasso rare ceramic pieces bearing three incised relief fish, which even the most demanding of visitors would not expect to find in a hotel. The Antiquities of Athens (1762-1816) depicting the ancient Tower of the Winds which has given its name to this lovely house. Its rooms have high, vaulted ceilings, an airy light blue on the walls, and timeless elegance in the authentic Santorinian period furniture: beauty, harmony, consistency of decor. A Corfiot commode is surrounded by Biedermeier chairs, while drums from ancient marble columns rest comfortably next to modern furniture, serving as side tables. A piano provides yet another means of expression in that specific scenery. The name derives from the collection of beautifully framed portraits gracing its walls, alongside oil paintings and engravings of philhellenic subjects. The specially designed furniture, although modern, blends in with the various Tsitouras Collection pieces beautifully. The decorative objects have been selected with great care and superb taste: two elaborate 19th century candelabra, antique mirrors in gilt frames, Russian icons, ancient oil lamps, carved wooden cherubs and other gilt pieces from an icon screen, bust of Sappho by an Italian sculptor. A collection of valuable white and blue 19th century Minton and Royal Copenhagen porcelain plates hand made and hand painted is the characteristic feature of this house; they are displayed in an authentic china cabinet from the same era. This collection includes elaborate Venetian mirrors, an 18th century icon in an old marble frame, a French engraving from the last century, a traditional gate-leg dining room table. Through the arched windows, in the dining room, one can see the breath-taking landscape, the meeting point of the sea and the sky in a vast blue scenery with the volcano of Santorini in the middle of it. Tsitouras Collection Villa (6 persons): 3 double bedrooms with en-suite marble bathrooms and shower on 2 floors. The bedroom on the lower floor is independent from the rest of the House and has its own mini kitchenette with fridge, coffee maker and cutlery. It has a sitting and a dinning area, a fully equipped kitchen. It also offers a terrace with a private pool (7m x 5m), where there is also a dining kiosk for 8 persons and sun beds. The interior of the villa is 80m² and the exterior space is 160m². Above rates include taxes, transportation to and from Santorini Airport or Port,a-la-carte American Breakfast and sunset coctail.